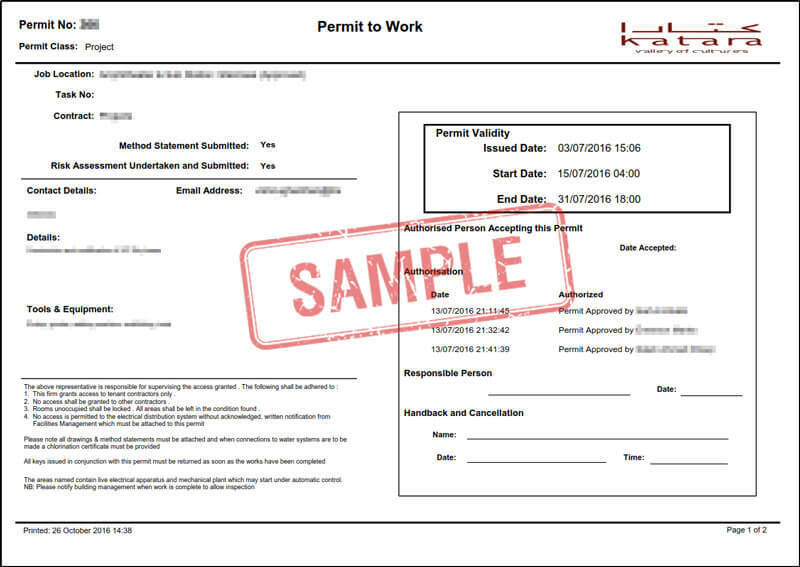 Before being able to commence works at Mosanada managed sites, all contractors must request a Permit to Work (PTW). Contractors should not arrive at site to conduct works without an APPROVED PTW. Complete the web based form below and attach relevant documents. Attend a compulsory Safety Induction session at Mosanada offices. Wait until you receive an APPROVED PTW. Processing is usually completed within 3 days. See example right. Do you have an FM challenge that requires fresh thinking? We would love to hear about it. Mosanada leverages its local knowledge and international pedigree to successfully deliver the full spectrum of facilities management services across a diverse range of properties in Qatar. Interested in a career with Mosanada? ©2016 Mosanada Facilities Management Services. All rights reserved.